Love pizza! Love pizza in any form! Pan, deep dish, casserole, egg rolls etc., doesn’t matter to me. Anything pizza goes, as long as it goes with a good pint. These are “simple Simon”, and create very little mess. Great at halftime! Prep before the game. Cut and form crescent roll sheet into 8 squares. 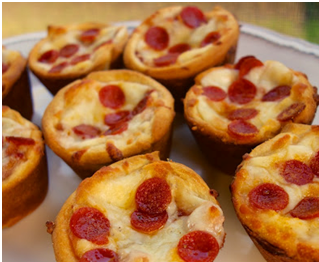 Press each piece of dough firmly into muffin cups. Sprinkle grated Parmesan cheese over each cup. Then, sprinkle shredded Mozzarella (about 1 Tbsp) to the bottom of each cup. Add 1 Tbsp of pizza sauce to each cup. Add assorted pizza toppings. Then sprinkle garlic powder over toppings. Bake 16 minutes in oven or grill (or to preferred look). Remove from pan, rest for 5 minutes, and serve.